Microchip offers a series of transceiver chips, which are qualified for 5 Mbit/s respectively 2 Mbit/s. Some products support stand-by functionality. The transceiver series ATA65XX is designed for CAN FD applications. Most components can be powered by the micro-controller with 3,3 V or 5 V. They are Grade 1 and Grade 0 qualified for automotive usage. All products specify a temperature range of -40 °C to +125 °C (optionally +150 °C). 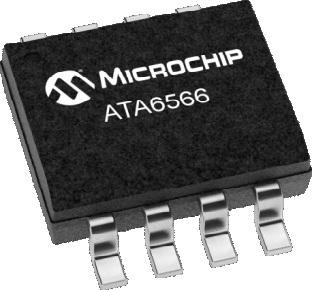 The ATA6566 and ATA6565 provide a low-power mode, meaning a stand-by function. The ATA6562 and ATA6564 transceivers support a silent mode; in this mode they transmit just recessive state. Except the ATA6566, the transceivers of this family are qualified for 5 Mbit/s. The ATA6565 provides two channels, which could be used for redundant network applications. The U.S. chipmaker presented this transceiver family on CiA’s roadshow. The ATA6566 has been developed for the Japanese market. This component is qualified for 2 Mbit/s. It supports also the low-power function and can be awaked by means of wake-up pattern (WUP) as specified in ISO 11898-2:2016. In low-power mode, the bus lines are biased to ground to reduce current consumption to a minimum. The transceiver monitors the bus lines for a valid wake-up pattern. This filtering helps to avoid spurious wake-up events that would be triggered by scenarios, such as a dominant clamped bus or by a dominant phase due to noise, spikes on the bus, automotive transients, or electro-magnetic interferences. The wake-up pattern consists of at least two consecutive dominant bus levels for a duration of at least tFilter, each separated by a recessive bus level. Dominant or recessive bus levels shorter than tFilter are ignored. The RXD pin remains at a high level until a valid wake-up event has been detected. If some of the above-mentioned chips indicate a dominant bus state for more than tRC_det, without the RXD pin doing the same, a recessive clamping situation is detected and the component is forced into silent mode (receive only). This fail-safe function is released by either entering stand-by or unpowered mode, or if the RXD pin is showing a dominant (e.g., low) level again. This behavior is not specified in the ISO standard.